This article is about the website and apps. For the Internet service provider, see MSN Dial-up. For other uses, see MSN (disambiguation). The current MSN home page design, introduced in 2014. The Microsoft Network was initially a subscription-based dial-up online service that later became an Internet service provider named MSN Dial-up. At the same time, the company launched a new web portal named Microsoft Internet Start and set it as the first default home page of Internet Explorer, its web browser. In 1998, Microsoft renamed and moved this web portal to the domain name www.msn.com, where it has remained. In addition to its original MSN Dial-up service, Microsoft has used the 'MSN' brand name for a wide variety of products and services over the years, notably Hotmail (later Outlook.com), Messenger (which was once synonymous with 'MSN' in Internet slang and has now been replaced by Skype), and its web search engine, which is now Bing, and several other rebranded and discontinued services. MSN.com in October 1996, with the logo used from 1995 to 1998. From 1995 to 1998, the MSN.com domain was used by Microsoft primarily to promote MSN as an online service and Internet service provider. At the time, MSN.com also offered a custom start page and an Internet tutorial, but Microsoft's major web portal was known as 'Microsoft Internet Start,' located at home.microsoft.com. 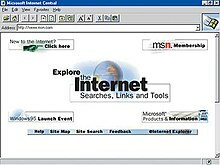 Internet Start served as the default home page for Internet Explorer and offered basic information such as news, weather, sports, stocks, entertainment reports, links to other websites on the Internet, articles by Microsoft staff members, and software updates for Windows. Microsoft's original news website, msnbc.com (now NBCNews.com), which launched in 1996, was also tied closely to the Internet Start portal. 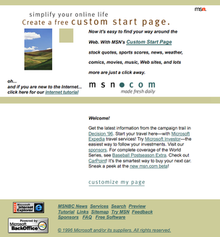 The relaunched MSN.com contained a whole family of sites, including original content, channels that were carried over from 'web shows' that were part of Microsoft's MSN 2.0 experiment with its Internet service provider in 1996–97, and new features that were rapidly added. MSN.com became the successor to the default Internet Explorer start page, as all of the previous 'Microsoft Internet Start' website was merged with MSN.com. Some of the original websites that Microsoft launched during that era remain active in some form today. Microsoft Investor, a business news and investments service that was once produced in conjunction with CNBC, is now MSN Money; CarPoint, an automobile comparison and shopping service, is now MSN Autos; and the Internet Gaming Zone, a website offering online casual games, is now MSN Games. Other websites since divested by Microsoft include the travel website Expedia, the online magazine Slate, and the local event and city search website Sidewalk.com. The former MSN 'butterfly' logo used from 2000 to 2009. MSN Dial-up continued to use this logo until 2016. In the late 1990s, Microsoft collaborated with many other service providers, as well as other Microsoft departments, to expand the range of MSN's services. Some examples include MSN adCenter, MSN Shopping (affiliated with eBay, PriceGrabber and Shopping.com), and the Encarta encyclopedia with various levels of access to information. Since then, MSN.com has remained a popular destination, launching many new services and content sites. MSN's Hotmail and Messenger services were promoted from the MSN.com portal, which provided a central place for all of MSN's content. MSN Search (now Bing), a dedicated search engine, launched in 1999. The single sign-in service for Microsoft's online services, Microsoft Passport (now Microsoft account), also launched across all MSN services in 1999. The MSN.com portal and related group of services under the 'MSN' umbrella remained largely the same in the early 2000s. The sports section of the MSN portal was ESPN.com from 2001 to 2004, and FoxSports.com from 2004 to 2014. MSN had an exclusive partnership with msnbc.com for news content from 1996 until 2012, when Microsoft sold its remaining stake in msnbc.com to NBCUniversal and the website was renamed NBCNews.com. Since then, MSN has launched 'MSN News', an in-house news operation. As of May 2005, MSN.com was the second most visited portal websites in the United States with a share of 23.2 percent, behind Yahoo! which held a majority. The former MSN 'butterfly' logo used from 2009 to 2014. ninemsn continued to use this logo until 2016. MSN released a preview of an updated home page and logo on November 3, 2009. It was originally expected to be widely available to over 100 million U.S. customers by early 2010. MSN rolled out the newer logo, together with a redesign of the overall website, on December 25, 2009. In 2012, MSN announced on its blog that it would be unveiling a new version of the MSN.com home page on October 26, exclusively for Windows 8, saying that the new version would be "clean, simple, and built for touch." Microsoft said it would be more app-like due to the speed of Internet Explorer 10. More new features included 'Flip Ahead', which allowed users to swipe from one article to the next. MSN for Windows 8 also had new deals with the AP and Reuters. Many of MSN's services were reorganized in 2005 and 2006 under a new brand name that Microsoft championed at the time, Windows Live. This move was part of Microsoft's strategy to improve its online offerings using the Windows brand name. The company also overhauled its online software and services due to increasing competition from rivals such as Yahoo! and Google. The new name was introduced one service at a time. The group of Windows Live services used Web 2.0 technology to offer features and functionality through a web browser that were traditionally only available through dedicated software programs. Some of the MSN services affected by the rebranding included MSN Hotmail, which became Windows Live Hotmail (now Outlook.com); MSN Messenger, which became Windows Live Messenger (now integrated into Skype); MSN Search, which became Live Search (now known as Bing); MSN Virtual Earth, which became Live Search Maps (now Bing Maps); MSN Spaces, which became Windows Live Spaces; MSN Alerts, which became Windows Live Alerts; and MSN Groups, which became Windows Live Groups. Some other services, such as MSN Direct, remained a part of the MSN family without transitioning to Windows Live. Following the launch of Windows Live, the MSN brand took on a different focus. MSN became primarily an online content provider of news, entertainment, and common interest topics through its web portal, MSN.com, while Windows Live provided most of Microsoft's online software and services. In 2012, Microsoft began to phase out the Windows Live brand, referring to each service separately by its individual brand name without any 'Windows' prefix or association. News: The latest news headlines and articles from a variety of hand-picked sources. Synced with the News app. Weather: Current weather conditions, forecasts, maps, news, and traffic. Synced with the Weather app. Entertainment: TV, movies, music, and celebrity news, as well as theater showtimes, tickets, and TV listings. Based on the former Bing Entertainment service. Also includes the MSN Games website for online casual games. Sports: Up-to-the-minute scores, standings, and headlines from leagues worldwide. Synced with the Sports app. Money: Stock market tickers and watchlists, personal finance, real estate, investments, currency converter, and more. Synced with the Money app. Travel: Destinations, trip ideas, hotel search, flight search, flight status, and arrivals and departures. Previously based on Farecast. Video: Trending and viral videos, comedy and pop culture, and videos from other MSN categories. Integrates with video search from Bing Videos. The top of the home page provides access to Microsoft services Bing, Outlook.com, Skype, Office Online, OneNote, OneDrive, Bing Maps, and Groove Music, as well as popular social media services Facebook and Twitter. Signing into MSN with a Microsoft account allows for personalized content to appear and to be synchronized across devices on the website and in the corresponding apps. The redesign of the website led to the closure of MSN's longtime personalized home page service 'My MSN', which was made up of customized RSS feeds, as the new website no longer supports user-specified RSS content. However, it added some customizability, allowing each category on the home page to be reordered or hidden. With the 2014 relaunch, MSN now supports responsive design and eliminates the need for a separate mobile website. The redesign of MSN proved positive and helped increase traffic with an additional 10 million daily visitors after two months. The MSN apps are a series of web-based cross-platform apps that primarily provide users information from sources that publish to MSN. Microsoft launched these apps along with the 2014 redesign of the MSN web portal, rebranding many of the Bing apps that originally shipped with Windows and Windows Phone. News, Weather, Sports, Money, and Travel first shipped with Windows 8, while Health & Fitness and Food & Drink first appeared in Windows 8.1. In December 2014, the apps became available across all the other major mobile device platforms as well: iOS, Android, and Fire OS. The apps allow users some, but not total, control of which sources provide information. Each app has its own color code that is used on the live tile and internally. Originally, each app brought a unified experience with the MSN website and synchronized preferences across devices; for example, setting a list of stocks to watch on MSN.com would show the same data on the MSN Money app on all devices where the user was signed in with a Microsoft account. The synchronization was dropped when the apps were rebuilt for Windows 10. There are currently four apps in the suite: News, Weather, Sports, and Money. In July 2015, Microsoft announced the discontinuation of the Food & Drink, Health & Fitness, and Travel apps on all platforms, and that they will not be bundled with Windows 10; those three apps are no longer offered. After Microsoft's acquisition of Nokia's mobile phone division, Microsoft also started bundling MSN services with its Nokia-branded feature phones, though the only supported model was the Nokia 215. In addition to these apps, Microsoft developed a separate set of mobile apps specifically for MSN China. Microsoft News (previously MSN News and Bing News) is a news aggregator and service that features the latest news headlines and articles hand-picked by editors around the clock from trusted sources across the web. The app includes sections for top stories, U.S., world, politics, money, technology, entertainment, opinion, sports, 'weekend reads', crime, and offbeat news. It allows users to set their own favorite topics and sources, receive notifications of breaking news though alerts, filter preferred news sources, and alter font sizes to make articles easier to read. Originally, News included an RSS feed, but that capability was removed; Microsoft currently only allows users to subscribe to specified news sources. News uses the chaseable live tile feature introduced in the Windows 10 Anniversary Update. If a user clicks on the News Start menu tile when a particular story is shown, the user will see a link to that story at the top of the app when it launches. MSN Weather (originally named Bing Weather) shows weather from a user's current location or any other location worldwide, and it allows users to define their favorite places, which will synchronize back to the web portal and across devices. Users can pin Weather tiles to the Start menu to see local weather conditions from multiple locations at a glance. It also offers satellite maps and has information regarding ski resorts. The app receives its weather conditions and forecasts from a variety of sources internationally. Weather uses weather conditions as the background, making it the only app that does not have a light/dark switch in Windows 10. Weather is not available for iOS; however, it comes preinstalled on the Nokia 215 phone from Microsoft Mobile that runs Series 30+; it is currently the only feature phone to have the app built-in. MSN Sports (originally named Bing Sports) displays various sports scores and standings from hundreds of leagues around the world, as well as aggregating sports-related articles and news headlines. Sports also allows the user to view slideshows and photo galleries, look up information about individual players and fantasy leagues, and set and track their favorite teams by selecting various topics from the hamburger menu. It also powers various predictive features within Microsoft's Cortana virtual assistant. MSN Money (originally named Bing Finance) allows users to set up lists of stocks to watch, follow certain corporations and receive stock updates, get the latest headlines regarding stock markets, view real-time trading figures with a 30-minute delay, track their own personal finances, calculate mortgages, get information on commodities and bonds, and convert currency. MSN Food & Drink (originally named Bing Food & Drink) was a recipe app that offers news related to food and drink, a personal shopping list that synchronizes across devices and the web, and a wine encyclopedia that contains information on over 1.5 million bottles of wine, over 3.3 million tasting notes, and hundreds of cocktail recipes. Users can control the app hands-free, add their own recipes from physical cookbooks or personal recipes by snapping a photo, add notes to recipes, and sort the recipes into collections. The app also collects information from famous chefs and lists them according to their style of cuisine. MSN Health & Fitness (originally named Bing Health & Fitness) allowed users to track their intake of calories, look up nutritional information for hundreds of thousands of different foods, use a built-in GPS tracker, view step-by-step workouts and exercises with images and videos, check symptoms for various health conditions, and synchronize their health data to third-party devices such as activity trackers. MSN Health & Fitness formerly connected data with the Microsoft HealthVault, but it started using a Microsoft account with MSN's own cloud service to synchronize data when it was rebranded from Bing to MSN. The app is not related in any way to Microsoft's Xbox Fitness or Microsoft Health (the companion app for the Microsoft Band), despite being similar in function. MSN Travel (originally named Bing Travel) was a travel search engine that allows users to book hotels and flights, aggregates travel-related headlines, and offers detailed information about thousands of travel destinations. Data in the app is powered by various travel websites, including Expedia, formerly owned by Microsoft. Other features include finding information on local restaurants, viewing pictures (including panoramas) and historical data about destinations, and reading reviews by previous travelers. If the user is signed in, Cortana can track flights and get hotel information through the app. MSN Travel was the only app in the suite that was exclusive to Windows. The app was discontinued in September 2015 but can still be accessed via the web. Previously, Microsoft had acquired Farecast in 2008, a website in the computer reservations system industry that offered predictions regarding the best time to purchase airline tickets. Farecast was founded in 2003 and collected over 175 billion airfare observations by 2007. Farecast's team of data miners used these airfare observations to build algorithms to predict future airfare price movements. Microsoft integrated it as part of its Live Search group of tools in May 2008 as Live Search Farecast; Microsoft rebranded it as Bing Travel on June 3, 2009, as part of its efforts to create a new search identity. In 2009, there were allegations that Bing Travel had copied its layouts from Kayak.com; Microsoft denied the allegations. By January 2013, Bing Travel results were powered by Kayak.com. As of January 2014, the fare prediction feature had been removed. As of May 2015, Microsoft rebranded the service to MSN Travel. In August 2015, MSN Travel flight search pages changed from being powered by Kayak.com to its competitor Skyscanner. Microsoft first offered content from its MSN web portal on mobile devices in the early 2000s, through a service it called Pocket MSN (in line with its Pocket PC products of the era) and later renamed MSN Mobile. The original MSN Mobile software was preloaded on many cell phones and PDAs, and usually provided access to legacy MSN services like blogs (MSN Spaces), email (Hotmail), instant messaging (MSN Messenger), and web search (now called Bing). Some wireless carriers charged a premium to access it. As many former MSN properties were spun off to Bing, Windows Live, and other successors in late 2000s, the Microsoft Mobile Services division took over the development of mobile apps related to those services. In the meantime, Microsoft's MSN apps took on a more content-related focus, as did the web portal itself. Previous versions of MSN apps that were bundled with Windows Mobile and early versions of Windows Phone, as well as MSN apps for Android and iOS devices in the early 2010s, were primarily repositories for news articles found on MSN.com. Other earlier MSN mobile apps included versions of MSN Weather and MSN Money for Windows Mobile 6.5, and 'MSN Money Stocks' and a men's magazine called 'MSN OnIt' for Windows Phone 7. Microsoft's world headquarters is in the United States, so the main MSN website is based there. However, MSN has offered various international versions of its portal since its inception in 1995 for dozens of countries around the world. A list of international MSN affiliates is available at MSN Worldwide. Following the redesign and relaunch of the MSN web portal in 2014, most international MSN websites share the same layout as the U.S. website and are largely indistinguishable from it, aside from their content. There were two exceptions: ninemsn, a longtime partnership between Microsoft and the Nine Network in Australia that launched in 1997 (Microsoft sold its stake in the venture and 2013 and ended its co-branding with Nine in 2016); and MSN China, an entirely customized version of MSN for China (Microsoft discontinued the portal in 2016, replacing it with a page that links to a number of other Chinese websites). ^ "Msn.com Traffic, Demographics and Competitors - Alexa". www.alexa.com. Retrieved 4 February 2019. ^ "Microsoft timeline and profile". About.com Web Trends. Retrieved 2012-05-01. ^ a b c "MSN works to find its focus". Archived from the original on 2007-06-06. Retrieved 2009-08-07. ^ a b c Bishop, Todd (September 30, 2014). "MSN's rebirth brings Microsoft's new approach into focus". GeekWire. Retrieved 2014-10-01. ^ a b "MSN Worldwide". Retrieved 2015-04-10. ^ "CNBC on MSN Money's StockScouter Celebrates Two-Year Track Record Of Outperforming Standard & Poor's 500" (Press release). PR Newswire. 8 July 2003. ^ "Is MSN Money the Same as Microsoft Money?". AZ Central. 5 December 2006. ^ "Savings and investing – MSN Money". MSN Money. 14 Oct 2014. ^ "New Microsoft Ad Campaign Encourages People to Experience The Everyday Web on MSN". Microsoft. 14 Feb 2000. ^ "MSN Explorer Update History". MSN. Retrieved September 26, 2017. ^ "Microsoft and NBC Complete Web Divorce". New York Times. 2012-07-15. Retrieved 2014-07-21. ^ "Hotmail, Messenger, nieuws en entertainment vind je op MSN.nl". Msn.com. 1999-12-31. Retrieved 2012-05-01. ^ "Microsoft Announces New Logo and Site Design". Microsoft.com. 2009-11-03. Retrieved 2012-05-01. ^ "MSN.com Preview". Neowin.net. Archived from the original on 2012-09-06. Retrieved 2012-05-01. ^ "Say hello to the new MSN butterfly". Retrieved 2009-10-31. ^ Muchmore, Michael (November 4, 2009). "PCMag.com: Microsoft Integrates Twitter Into MSN Redesign". PC Magazine. Retrieved 2009-11-05. ^ MSN Team. "The All New MSN for Windows 8". Microsoft. Archived from the original on 3 October 2012. Retrieved 26 March 2014. ^ Albanesius, Chloe. "Microsoft Overhauls MSN for Windows 8, IE10". PC Magazine. Retrieved 26 March 2014. ^ "Cloud services for Windows 8 and Windows Phone: Windows Live, reimagined". MSDN. 2012-05-02. Retrieved 2014-07-21. ^ Whitney, Lance (30 September 2014). "Microsoft unveils MSN makeover, rebranded apps". CNET. ^ M., Atlas (11 May 2014). "MSN Autos is back! (sort of)". Opposite Lock. ^ Viswav, Pradeep (12 November 2014). "MSN Health and Fitness App Now Allows You To Keep Track Of Steps Taken From Lockscreen". Windows Mobile PowerUser. ^ T., Nick (26 June 2014). "Bing Food & Drink to debut in Windows 8.1, foodies take note". Phone Arena. ^ Saleem, Hammad (11 December 2014). "The MSN suite of apps formerly known as Bing come to iOS and Android". WinBeta. ^ Gilbert, Ben (December 11, 2014). "Microsoft everywhere: MSN apps head to iOS and Android, company buys app service". Engadget. Retrieved December 15, 2014. ^ O'tato, Tim (11 December 2014). "Microsoft Launches Suite of MSN Apps to Google Play, Includes Weather and Sports". Droid-Life. ^ Selleck, Evan (11 December 2014). "Microsoft Launches M.S.N. applications for Google Android devices". Android & Me. ^ Edmonds, Rich (11 December 2014). "Microsoft's MSN suite of apps are now available on Android". Android Central. ^ Trenholm, Rich (8 September 2014). "Microsoft rebrands Bing apps under revamped MSN, coming soon to Android and iOS". CNet. ^ "Microsoft killing Photosynth and MSN apps, including Health & Fitness, Food & Drink". PC World. Retrieved 19 July 2015. ^ Rawat, Sam (5 January 2015). "Microsoft unveils Nokia 215 and 215 Dual SIM". G.S.M. Arena. ^ Brian, Matt (5 January 2015). "Microsoft's Nokia 215 is its cheapest connected phone yet". MSN. ^ a b Fraser, Adam (5 January 2015). "Meet Nokia 215: our most affordable Internet-ready entry-level phone yet". Lumia Conversations. Archived from the original on 5 January 2015. ^ Rubino, Daniël (7 August 2013). "Microsoft announces Bing Apps for Windows Phone 8, bringing News, Weather, Sports and Finance to the small screen [Updated]". Windows Central. ^ "MSN News for Windows 10 now lets you add select media sources (Fast Ring)". ^ "Chasable Live Tiles, Adaptive notifications, improved Action Center coming to Windows 10 – On MSFT". 1 April 2016. ^ Schwartz, Barry (16 April 2013). "Bing Updates Windows 8 Apps Enhancing News, Finance, Weather, Sports, Maps & Travel". Search Engine Land. ^ Updates, Wide (27 August 2013). "BING WEATHER :REVIEW". WideUpdates. ^ none, Ron (7 August 2013). "Bing News, Finance, Sports, and Weather apps released for Windows Phone 8". WinBeta. ^ Wagner, Alex (11 December 2014). "Microsoft has been bolstering its multi-platform mobile efforts in a big way lately". Phone Dog. ^ Doe, John (11 December 2014). "Microsoft Launches Suite of MSN Apps on iOS, Android and Amazon Devices". iClarified. ^ Gupta, Guarav (19 June 2012). "Bing Sports App in Windows 8". C Corner. ^ Thurrott, Paul (10 August 2013). "Windows Phone 8 App Picks: Bing Finance, News, Sports and Weather, The best Windows 8/RT mobile apps arrive on Windows Phone 8". Windows Supersite. ^ McDonald, Brian (31 May 2012). "Bing Announces News, Sports and Travel apps for the Windows 8 Release Preview". Bing Blogs. ^ Saxena, Anupam (8 August 2013). "Microsoft launches Bing News, Bing Finance, Bing Weather and Bing Sports apps for Windows Phone 8". NDTV Gadgets. ^ Callaham, John (18 February 2014). "Bing Windows Phone apps now sync to Windows 8". Neowin. ^ Leonhard, Woody (10 April 2014). "The Windows 8.1 Bing Finance App". Dummies.com. ^ Hattersley, Rosemary (6 June 2012). "Bing Finance for Windows 8 review". Personal Computer Advisor. ^ Amin, Suril (27 June 2013). "Microsoft Details New Windows 8.1 Bing App: Food & Drink". Microsoft-News. ^ Wahab, Fatima (29 June 2013). "Food & Drink: The Windows 8.1 Recipe App With Hands-Free Control". Addictive Tips. ^ Fingas, Jon (30 January 2014). "New Microsoft app brings recipes and grocery lists to your Windows Phone". Engadget by America On-Line. ^ Dredge, Stuart (18 February 2014). "Microsoft gets active with Bing Health & Fitness Windows Phone app Beta release comes amid wider interest in health and fitness tracking from Google, Apple and other tech giants". the Guardian. ^ Woods, Ben (18 February 2014). "Bing Food & Drink, Health & Fitness, Travel apps add sync, drop beta tag on Windows Phone 8". The Next Web. ^ Pai, Aditi (3 July 2013). "Microsoft launches Bing health and fitness app". Mobi Health News. ^ Thurrot, Paul (30 September 2014). "New MSN Goes Live on Windows, Windows Phone and Web". ^ McDonald, Brian (7 September 2014). "A first look at the new MSN". The Official Microsoft Blog. ^ Thurrott, Paul (31 October 2014). "A Quick Guide to Microsoft's Health Offerings, Separate for good reasons". SuperSite for Windows. ^ Weir, Andy (27 January 2014). "Microsoft launches Bing Travel Beta app for Windows Phone". Neowin. ^ Guim, Mark (26 January 2014). "Travel the world with Windows Phone 8 on Bing Travel Beta". Windows Phone Central. ^ Gupta, Guarav (20 June 2012). "Bing Travel App in Windows 8". C#Corner. ^ Smith, Chris (17 October 2014). "Microsoft gives Cortana a boost through new Bing features". Trusted Reviews. ^ Martin, Julia (14 December 2014). "Microsoft's MSN apps no longer exclusive to Windows; available for iOS and Android". Inferse. ^ "Microsoft buys travel search site". theregister.co.uk. 2008-04-18. ^ "Farecast.com Launches Airfare Deals Based On Science, Not Marketing". Farecast.com. 2007-03-13. Archived from the original on 2007-03-17. ^ Mohl, Bruce (2006-06-04). "While other sites list airfares, newcomer forecasts where they're headed". boston.com. ^ Johnson, Nathania (1 June 2009). "Bing's Best Features are the Ones You Didn't Know Existed on Live Search". Search Engine Watch. ^ "Kayak to Bing: Stop Copying Us! - Update". wired.com. June 24, 2009. ^ O'Neill, Sean (20 January 2015). "Microsoft all but closes Bing Travel, expands MSN Travel". TNOOZ. ^ Arghire, Ionut (30 September 2010). "Windows Phone 7 Confirmed with Messenger and MSN Apps". Softpedia. Archived from the original on 26 March 2015. ^ "MSN for Windows Phone". Microsoft. Retrieved 2012-03-11. ^ "MSN for iPad". Apple Inc. Retrieved 2012-03-11. ^ "MSN for Android". Google. Retrieved 2012-03-11. ^ Zheng, Long (10 March 2009). "Widgets: Windows Mobile 6.5 joins the "web applications" bandwagon". iStartedSomething. ^ Webster, Daniel (12 February 2010). "Marketplace Pick: MSN Weather Widget". PocketNow. ^ Surur, Suril (28 October 2010). "Windows Mobile 6.5 gets Widget Engine". Windows Mobile PowerUser. ^ Ritchie, Jennifer (10 November 2010). "Cypress Creates New MSN Money Stocks Application for Microsoft Windows Phone 7". 24-7 Press Release. ^ Surur, Suril (11 April 2011). "MSN Onit for (US) men only (video)". Windows Mobile PowerUser. ^ Hayes, Alex (11 May 2016). "Ninemsn brand set to disappear as Nine renames site". Mumbrella. Retrieved 28 June 2016. ^ Yan, Sophia (10 May 2016). "Microsoft is giving up on its Chinese web portal". WISN 12. This page was last edited on 15 April 2019, at 14:18 (UTC).